Recently voted as ‘England’s Best Golf Course’ at last year’s World Golf Awards, the legendary Brabazon course, has received yet further praise. On this occasion, the plaudits have come from the 59Club benchmarking programme, scoring extremely high for the immaculate course conditioning. This however hasn’t stopped The Belfry’s Director of Golf Courses, Angus Macleod and his expert team of green staff resting on their laurels; undertaking a series of course improvements to reinvigorate the world’s only 4-time Ryder Cup host course. The 59Club conducts ‘Mystery Shopper’ audits at leading venues across the UK to provide an industry standard for quality of facilities and level of service, allowing golf resorts to benchmark their performance against competitor venues. This process accounts for every aspect of the golf experience, from the initial booking, through to the welcome, course condition and post-golf facilities. The Brabazon course has received exceptional results from the 59Club, with a 2015 audit score of 92.8%, including an incredible 98.5% in the October audit for its pristine conditioning and playability. The impressive full year audit score was well above the 85% threshold required for a Gold Standard performance. 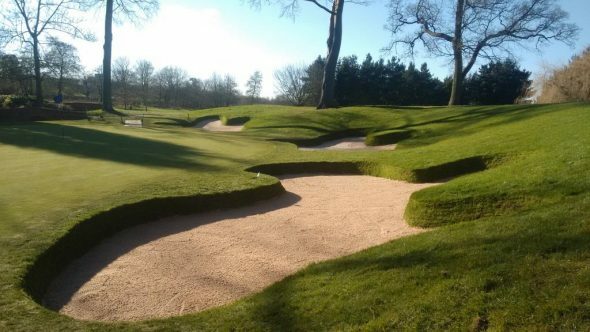 Despite these accolades for The Brabazon, Angus Macleod and his team of green staff have been working on a series of improvements to certain holes in order to enhance the course’s visual appeal and playability. This has been specifically apparent on the iconic risk-and-reward 10th hole, where three individual bunkers have been installed, in place of the one large bunker around the green, reminiscent of how they were during the 2002 Ryder Cup. “We wanted to utilise all of the team’s understanding of the golf course to implement changes that will enhance golfers’ experiences, whilst continuing to improve playability. We wanted to be bold with the changes that we made, but obviously didn’t want to take anything away from the legendary layout,” summarised Macleod. To book your own Brabazon experience at The Belfry Hotel & Resort, visit www.TheBelfry.co.uk or call 0844 980 0600. Ed Saxel is iSpyGolf's resident pro and the main contributor to the blog, sharing a healthy mix of personal musings, course reviews, and golfing rants. We'll throw in contributions from guest authors and reviewers, too.